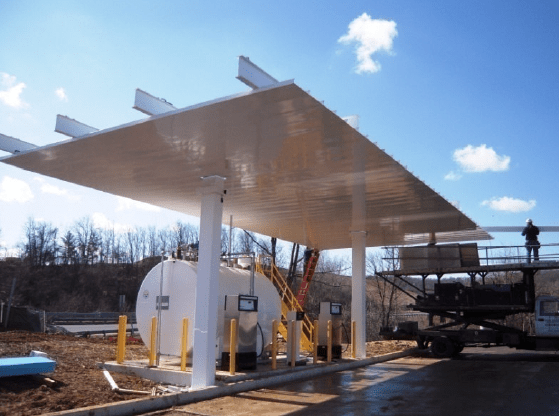 Pre-engineered steel canopies are ideal for various organizations that need to offer protection and shelter for employees, equipment, vehicles, or fueling dispensing systems. Most of the canopies that Shelters Direct installs are pre-engineered. Pre-engineered steel canopies can save your project time and money. The reason for this is that canopies are factory fabricated in a controlled environment. This method is more cost-effective and doesn’t require the coordination of multiple trades. In this week’s blog, we investigate why pre-engineered canopies are not only more cost-effective but also more efficient. 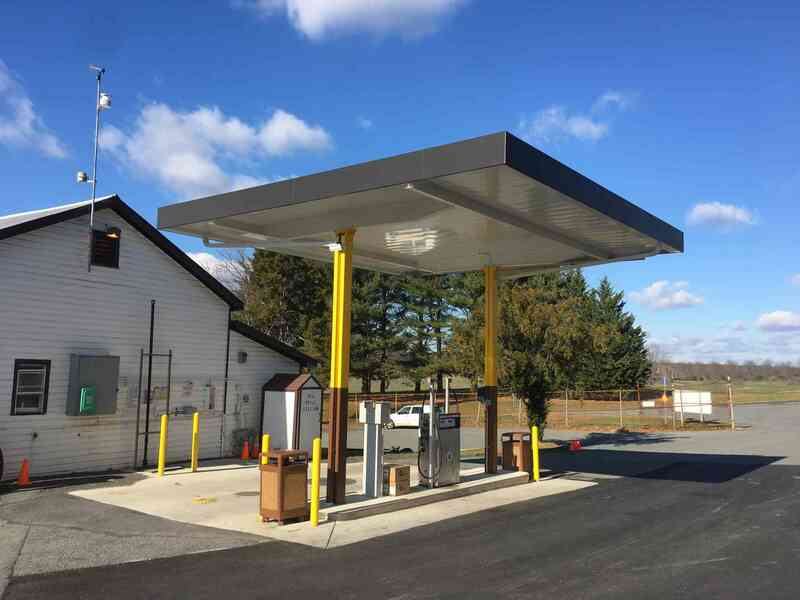 Pre-engineered steel canopies, like this fueling canopy we refurbished in Montgomery County, are designed and fabricated in one location. As stated before, “pre-engineered” simply means that the steel canopy is factory designed and fabricated in one location. Having a canopy pre-engineered means that you are bypassing various trades that would add to the overall time and cost of your canopy installation. Instead of coordinating trades like roofing, metal work, and iron works on site, everything is handled in a controlled environment. Keeping these trades in a controlled environment allows portions of the work to be handled before the canopy even reaches your location. The only things that need to happen on the job site are pouring concrete, painting the structural steel and columns (your fascia and decking is pre-finished), and wiring electrical connections (if needed). Keep in mind that some canopies do not need electrical wiring at all, but pouring concrete is always needed. Assembling a pre-engineered canopy is much easier and faster than other canopy installations. Because these canopies are fabricated offsite, no hot work is done at your location. Another advantage of factory fabrication is a higher standard of quality control. When the pieces are delivered to your location, they are put together with a simple bolt-together process. It’s important to note that Shelters Direct is capable of providing you with an entirely customized canopy to meet the needs of your industry. It’s important to specify these needs when you talk to our dedicated Shelters Team. They can assist you with customization and any others canopy questions you have. To learn more about our canopies, view our Canopy Page on our website, our Canopy Featured Projects, or our Canopy FAQ Post. This entry was posted on Tuesday, January 24th, 2017	at 8:36 am	. You can follow any responses to this entry through the RSS 2.0	feed. Both comments and pings are currently closed.